The history of the Vietnam War is invariably delineated by historians as a continuum of escalating involvement from the administrations of Eisenhower through Nixon. This essay by Prof. Norwood challenges that notion by demonstrating how the vision of John F. Kennedy was consistently and vehemently opposed to conventional warfare there. 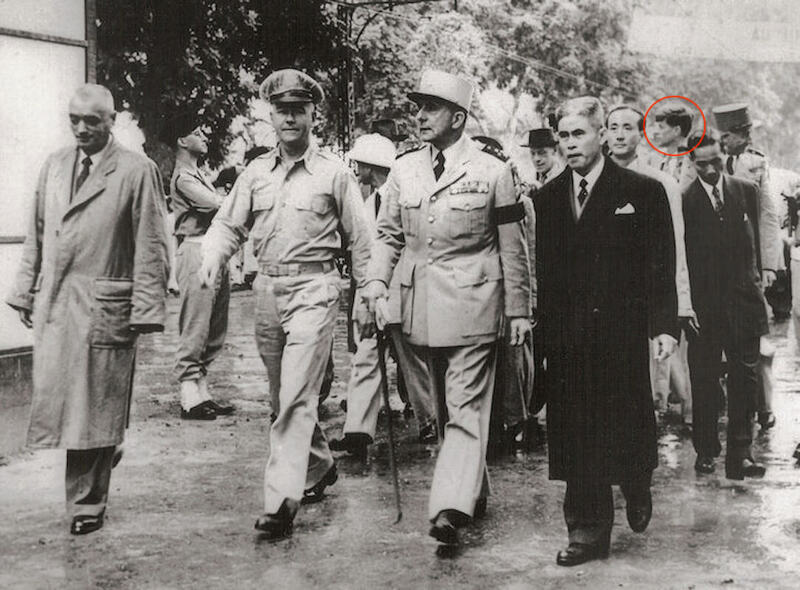 In the 1951 photograph above, General Jean de Lattre de Tassigny is leading a contingent through the streets of Saigon at a time when France was engaged in a losing cause during the First Indochina War. In the back of the pack, a young congressman from Massachusetts, John F. Kennedy, is observing the conditions on the ground in a war effort that was at the time receiving substantial American aid. Kennedy’s younger brother Robert accompanied him on the trip. RFK later ran on an anti-war platform at the height of the Vietnam War, shortly before his assassination in 1968. This study explores the impact of the 1951 trip to Vietnam on John F. Kennedy, his association with the diplomat Edmund Gullion, and the evolving vision of JFK for American foreign policy in Vietnam, which was articulated in a major address given in 1954. Gullion was also a confidant of the young Congressman and World War II hero John F. Kennedy, who visited Saigon in 1951. Congressman Kennedy was there to observe up close the conditions of a foreign colonial war in progress, in preparation for his run for the Senate the next year against Henry Cabot Lodge. Later, he used Gullion as a sounding-board as he was shaping his own views on America’s role in Southeast Asia and the Third World. During his presidency, JFK appointed Gullion as ambassador to the Congo.2 Gullion’s oral interviews and the words of JFK himself help to shed light on the congressman’s formation as a statesman in the period before he acceded to the presidency. The year 1954 is an especially important crossroads in the history of Vietnam and a turning point for JFK in articulating a foreign policy for Southeast Asia. At the time, he described in a radio interview what he believed should be the primary goal of combatting communism in the Third World, which was “not the export of arms or the show of armed might but the export of ideas, of techniques, and the rebirth of our traditional sympathy for and understanding of the desires of men to be free.”4 When Kennedy met with Indian Prime Minister Jawaharlal Nehru, he asked Nehru for his view on the current war in French Indochina. Nehru replied that the military and financial assistance provided to the French by the United States was a “bottomless hole” because the war was an example of doomed colonialism.5 Upon arriving in Vietnam, the Kennedy entourage observed Charles de Gaulle and the top brass of the French military as the war was in progress. But, more significantly, the young Congressman was to have a fateful meeting with an American consular officer named Edmund Gullion. In March of 1952, Kennedy spoke to an audience in Everett, Massachusetts, voicing his opposition to sending American troops to assist the French in Indochina. In April, he addressed a Knights of Columbus chapter in nearby Lynn, stating that “we should not commit our ground troops to fight in French Indochina.”11 In an editorial in The Traveler,the Congressman received praise for taking a stand against the status quo: “Mr. Kennedy is doing a service in prodding our conscience.”12 It was clear in 1952 that Kennedy was as outspoken of American aid to the French as he was against the French colonial war itself. JFK’s speech in the Senate came at a turning point in the modern history of Vietnam in the year 1954. After a brutal, fifty-seven day standoff in northwestern Vietnam, Dien Bien Phu fell to the forces of Ho Chi Minh on May 7. With aid from the Chinese and Russians, the Viet Minh commander Võ Nguyen Giáp had amassed troops and, most importantly, heavy artillery that negated the formidable French airpower. The collapse and surrender of the French that followed were the result of Giáp’s brilliant tactical campaign at Dien Bien Phu. In July, French Prime Minister Pierre Mendès-France put his signature to the Geneva Accords that effectively marked the end of French control of Indochina. The Geneva agreement stipulated that in the nation’s transition to independence, there would be a temporary partition of the country pending a national election to be held in the summer of 1956. With that knowledge, the Eisenhower administration continued its unalloyed engagement in Vietnam. Kennedy was most likely expressing to Eisenhower his personal outrage when he had learned that secret discussions had occurred about deploying atomic warfare in Vietnam to support the fading French prospects of victory. In his speech, Kennedy’s concerns for disclosure were being raised prior to the outcome of the battle of Dien Bien Phu and months before the American subversion of the Geneva Accords that resulted in the artificial division of Vietnam against the will of the Vietnamese people. As he was speaking in the Senate, there was as yet no design for a portion of Vietnam to become an American client state led by a puppet ruler like Diem. It was precisely such a scenario that Kennedy feared. This coda to Kennedy’s speech could have been a road map to the future to avoid what became the tragedy of the Vietnam War. JFK’s tour-de-force Senate address of 1954 was not political grandstanding. Rather, it was a carefully formulated examination of the question of American intervention in Vietnam at a pivotal moment for both nations. Prior to the Senate speech, Kennedy had spoken to the Cathedral Club in Brooklyn, New York, stressing that the French could not withstand the united forces of Ho Chi Minh, who “has influence penetrating all groups of society because of his years of battle against French colonialism.”24 As he would say again in late 1961 to his advisors, the situation was far different from the recent Korean conflict, wherein an independent government in the south was threatened by the invading communists from the north. Even before the Geneva Accords had mandated free elections to unify Vietnam and before Eisenhower began to use the expression “domino theory,” Kennedy had identified the unique circumstances of Vietnam’s long struggle for independence, as distinct from a nation that America could potentially “lose” to communism. After the Senate speech, Kennedy followed up with a television appearance, indicating that the French could not possibly retain Indochina and that again, as he would say seven years later, “American intervention with combat troops would not succeed.”25 In another 1954 speech in Los Angeles, Kennedy asserted that the American people “have been deceived for political reasons on the life and death matters of war and peace.”26 He reiterated this theme before the Whig-Cliosophic Society of Princeton University and the Executives Club in Chicago, stressing above all the importance of recognizing independent movements for nationhood in the Third World and distinguishing them from the global expansion of communism. In response to Vice President Richard Nixon’s call to send American ground troops into Vietnam, Kennedy responded that if we were to do that, “We are about to enter the jungle to do battle with the tiger.”27 By the end of 1954, an imaginary line would be drawn across Vietnam as a result of the Geneva Accords. But a very different line was being drawn in the sand by John F. Kennedy: one that proscribed American military intervention. The 1954 Senate speech, which was addressed to President Eisenhower, was a prescient warning about repeating the mistakes of the French. Ultimately, it was advice that was ignored after the death of President Kennedy by his successors, Lyndon B. Johnson and Richard M. Nixon. After such speeches, the Stevenson election team asked Kennedy to refrain from making further foreign policy remarks in the course of the campaign. Senator Kennedy was unsuccessful in his quest for the nomination of Vice President on the Stevenson ticket. Which was probably a blessing in disguise. This counsel reflected the lessons learned by de Gaulle himself from Dien Bien Phu and Algeria. But John F. Kennedy hardly needed this advice from de Gaulle, as his thinking about the emerging nations of Africa, the Middle East, and Southeast Asia had been formed after a decade of close study and hands-on experience during his travels. His 1954 address in the Senate could be a blueprint even today for correcting the misguided American attempts at “nation building” abroad.32 From the time he traveled to Vietnam until his death, Kennedy had the clarity of thinking to understand that the struggle in Vietnam was the story of nationalism, not a Cold War intrigue. And the thinking that informed his vision was guided at the outset by the words he had heard in 1951 from Edmund Gullion. The military historian John M. Newman observes that “at 12:30 P.M., on Friday, November 22, the rifle shots rang out in Dealey Plaza that took the president’s life. His Vietnam policy died with him.”37 Lyndon Johnson’s decision to use the Gulf of Tonkin affair as the pretext to send combat troops into Vietnam, escalate the war, prop up a string of South Vietnamese dictators in a client state, and, finally admit failure, when choosing not to run for reelection as President in 1968, has tended to erase the memory of JFK’s goal of withdrawing all military advisors no later than 1965. In Kennedy’s plan, the initial phase-out of one thousand advisors would be accomplished by the end of 1963. A public announcement would be made to set these decisions “in concrete.”39 McNamara’s recall of the NSC meeting was corroborated when, in the late 1990s, the Assassination Records Review Board (ARRB) released tape recordings of key meetings during the Kennedy presidency, including those of the National Security Council sessions of October 2 and October 5, 1963, wherein all of McNamara’s points were confirmed. McNamara’s voice appears on the tape, stating, “We need to get out of Vietnam, and this is a way of doing it.”40 Shortly after the NSC meetings, JFK approved the Top Secret National Security Action Memo 263. Declassified in the early 1990s, the document identifies the first phase of the withdrawal of one thousand U.S. military personnel by the end of 1963. The combination of contemporary eyewitness testimony, oral history, recollections of statesmen, tape recordings of meetings, documentary evidence, and, above all, President Kennedy in his own words, points to his capacity as commander-in-chief to steer the United States away from what became the tragedy of the Vietnam War following his assassination. 2 At a critical stage in the crisis of the Diem regime in Vietnam in the summer of 1963, JFK wanted to appoint Gullion as ambassador in Saigon. But Secretary of State Dean Rusk opposed the nomination of Gullion in favor of an opposition party member, the Republican Henry Cabot Lodge. In an effort to show bipartisan unity, JFK went along with Rusk. But the appointment of Lodge was a grave mistake that eventually JFK would regret. Robert Kennedy had also preferred the selection of Gullion, warning his brother that Lodge would create “a lot of difficulties in six months.” RFK’s words were prophetic, especially at the time of the CIA-backed assassination of Ngo Dinh Diem that occurred six months later and unbeknownst to the President. James W. Douglass, JFK and the Unspeakable: Why He Died and Why It Matters (Mary Knoll, NY: Orbis Books, 2008), 151. 3 Robert Dallek, An Unfinished Life: John F. Kennedy—1917-1963 (New York: Little Brown and Company, 2003), 165. 8 Kennedy’s advisors included Robert McNamara, Dean Rusk, McGeorge Bundy and his brother William, and Eugene Rostow and his brother Walt. These were the men identified by journalist David Halberstam as “the best and the brightest” of the intellectuals in JFK’s administration. After the president’s assassination, these civilian policy makers would be complicit with Lyndon Johnson as the chief architects of the disastrous war in Vietnam. 9 Herbert S. Parmet, Jack: The Struggles of John F. Kennedy (New York: The Dial Press, 1980), 228. 13 Oral History with Edmund A. Gullion, July 17, 1964. 14 Oral History with Edmund A. Gullion, July 17, 1964. 15 Oral History with Edmund A. Gullion, July 17, 1964. 16 The clandestine operation of Lansdale has been documented with great thoroughness by Talbot and Douglass, as per bibliography. 17 Richard Mahoney, JFK: Ordeal in Africa (Oxford and New York: Oxford University Press, 1983), 139. Quoted in James DiEugenio, Destiny Betrayed—JFK, Cuba, and the Garrison Case, second edition (New York: Skyhorse Publishing, 2012), 24. 18 The 1958 bestselling novel The Ugly American, written by Eugene Burdick and William J. Lederer, exposed the smooth tactics of counterintelligence, propaganda, and force exerted by American operatives to win “hearts and minds” in a fictitious Southeast Asian nation. The thinly veiled portrait of Lansdale was apparent in the wily character of Colonel Edwin Hillendale, whose psychological ploys sought to convert the nation to the American way. Senator John F. Kennedy loved the novel and purchased one hundred copies for distribution to the entire United States Senate. He also paid for a large advertisement of the book in The New York Times. 22 John F. Kennedy, Senate Address on Indochina, April 6, 1954. Shortly after the period in which Edmund Gullion was stationed in Vietnam, Charlton Ogburn became an intelligence officer in Southeast Asia, writing memos to the State Department and warning of the dangers of military involvement in Vietnam. His voice was completely ignored by the overconfident civilian leaders in Washington. Ogburn believed that the reach of the authorities was “totalitarian” in nature, a reality that was grasped by Plato, who may have been the first to identify the amorphous power of the “State” in the example of ancient Athens. For Ogburn, Vietnam was a “laboratory” for understanding how dogma is wielded by authority figures. He later recalled that “we lost over fifty thousand lives in Vietnam because the authorities could not be budged. Their appraisal of themselves was based on their being right …. They had to be right.” The passage of time would prove Ogburn to be correct in his assessment of Vietnam. Writing in 1989, Andrew Jon Rotter in The Path to Vietnam—Origins of the American Commitment to Southeast Asia (Ithaca, New York: Cornell University Press, 1989) refers to Ogburn’s dispatches to State Department officials as “startling and prophetic” in his early critique of the false assumptions guiding U.S. policy. Ogburn concluded one of his memos to Dean Rusk with a statement that spoke for the rights of Third World nations caught up in the Cold War. Referring to the people of Southeast Asia, Ogburn wrote, “Darn it, they are the ones who are threatened with a fate worse than death—not we.” Around the same time, John F. Kennedy was making virtually the same argument in his Senate speech of April 4, 1954. 23 John F. Kennedy, Senate Address on Indochina, April 6, 1954. 29 Arthur Schlesinger, Jr., A Thousand Days—John F. Kennedy in the White House (New York: Fawcett, 1965), 310-11. 30 Quoted in James DiEugenio, Destiny Betrayed—JFK, Cuba, and the Garrison Case, second edition (New York: Skyhorse Publishing, 2012), 25. 32 As observed by biographer David Talbot, “Kennedy’s thinking about the historical imperative of Third World liberation was remarkably advanced. Even today, no nationally prominent leader in the United States would dare question the imperialistic policies that have led our country into one military nightmare after another. Kennedy understood that Washington’s militant opposition to the world’s revolutionary forces would only reap ‘a bitter harvest.’” Talbot, The Devil’s Chessboard—Allen Dulles, the CIA, and the Rise of America’s Secret Government (New York: Harper Collins, 2015), 362. 33 In the popular Steven Spielberg film The Post, the screenwriters lump together on multiple occasions the American Presidents from Eisenhower to Nixon, suggesting that each President was on board with military intervention in Vietnam, as the American commitment grew exponentially from one administration to the next. But the historical record suggests that this was not the case during Kennedy’s thousand-day presidency. 34 David Talbot, Brothers—The Hidden History of the Kennedy Years (New York: Free Press, 2007), 215. 37 John M. Newman, JFK and Vietnam—Deception, Intrigue, and The Struggle for Power (self-published, 2016), 458. 38 James DiEugenio, Reclaiming Parkland—Tom Hanks, Vincent Bugliosi, and the JFK Assassination in the New Hollywood (New York: Skyhorse Publishing, 2016), 188. 39 James K. Galbraith, “Exit Strategy: In 1963, JFK Ordered a Complete Withdrawal From Vietnam,” Boston Review (September 1, 2003). Dallek, Robert. An Unfinished Life: John F. Kennedy—1917-1963. New York: Little Brown and Company, 2003. DiEugenio, James. Destiny Betrayed—JFK, Cuba, and the Garrison Case, Second Edition. New York, Skyhorse Publishing, 2012. DiEugenio, James. Reclaiming Parkland—Tom Hanks, Vincent Bugliosi, and the JFK Assassination in the New Hollywood. New York: Skyhorse Publishing, 2016. Douglass, James W. JFK and the Unspeakable: Why He Died and Why It Matters. Mary Knoll, NY: Orbis Books, 2008. Galbraith, James K. “Exit Strategy: In 1963, JFK Ordered a Complete Withdrawal From Vietnam,” Boston Review, September 1, 2003. Mahoney, Richard. JFK: Ordeal in Africa. Oxford and New York: Oxford University Press, 1983. Newman, John M. JFK and Vietnam—Deception, Intrigue, and the Struggle for Power, second edition. Self-published, 2016. Parmet, Herbert S. Jack: The Struggles of John F. Kennedy. New York: The Dial Press, 1980. Rotter, Andrew Jon. The Path to Vietnam—Origins of the American Commitment to Southeast Asia. Ithaca, New York: Cornell University Press, 1989. Saxon, Wolfgang. “Edmund Asbury Gullion, 85, Wide-Ranging Career Envoy. “ Obituary, The New York Times, March 31, 1998. Schlesinger, Arthur, Jr. A Thousand Days—John F. Kennedy in the White House. New York: Fawcett, 1965. Talbot, David. Brothers—The Hidden History of the Kennedy Years. New York: Free Press, 2007. Talbot, David. The Devil’s Chessboard: Allen Dulles, the CIA, and the Rise of America’s Secret Government. New York: Harper Perennial, 2016.